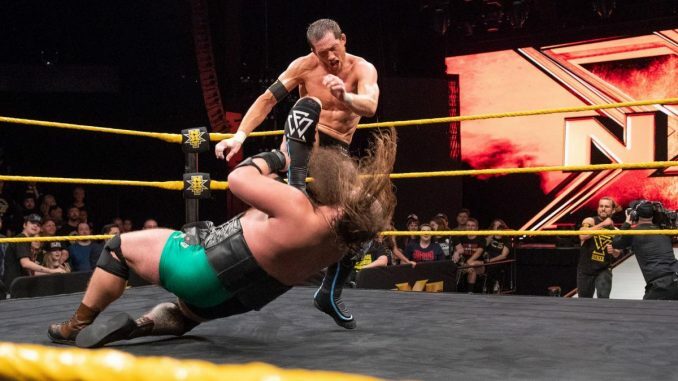 John Pollock reviews the final episode of NXT before TakeOver with Kyle O'Reilly taking on Hanson and the winner's team receiving the advantage at War Games. -On the final episode before TakeOver, the main event saw Kyle O’Reilly defeat Hanson, so the Undisputed Era will have the numbers advantage during War Games. The match was very good and the only part of the show I’d recommend catching if you missed the show. O’Reilly attacked the knee of Hanson throughout the match utilizing dragon screw leg whips and leg kicks. Hanson came back with his power moves but was a backdrop for the other members of the teams to get involved. Everyone came down and brawled ringside until Ricochet hit a tope con giro. With the referee distracted, O’Reilly hit Hanson with the tag belt and pinned him. They pushed that Hanson and Pete Dunne both had their knees attacked so the babyfaces are going into the match less than 100%. -I would not consider O’Reilly underrated, but he is so damn good and considering how stacked the talent situation is in NXT, he is in the top echelon and of the most versatile performers they have. -The rest of the show was unremarkable with a heavy push on the matches for Saturday with video packages for the major programs. They made it official that Kassius Ohno and Matt Riddle will have a match on next week’s show, which will be taped prior to TakeOver in Los Angeles this Saturday night. Riddle plays the stoner dude well, his charm is impossible not to like. -Bianca Belair and Mia Yim had a lengthy match to start the show with Belair winning with the KOD, which is a torture rack into a facebuster. Belair continues to show improvement, Yim has lots of experience and is a strong addition to the women’s roster. Belair has been pushed as the next title challenger, which would make more sense for Kairi Sane to have the title after this weekend. However, I don’t think Belair is going to last as a heel and can see the fans turning her and a program with Baszler would force that turn. -Lacey Evans won a squash over Clarissa Rivera with the Woman’s Right. She cut a promo after the match stating that NXT is full of “classless nasties”, who have forgotten what it’s like to carry yourself with sophistication and is going to teach them manners with the woman’s right. This character hasn’t clicked for me and while there is no shortage of great female performers on the NXT roster, they clearly see a lot in Evans because she is featured prominently. -TakeOver looks excellent and has the chance to be one of the best cards of 2018. If you missed this show, I recommend the main event but as an overall show, this wasn’t going to change anyone’s mind on Saturday’s show if they weren’t already invested.